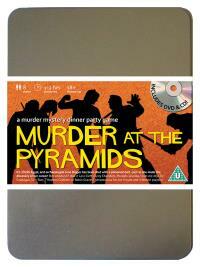 You've been invited to play the role of DUSTY CHAMBERS in Murder at the Pyramids. Egypt, 1924, and archaeologist June Digger has made the most incredible discovery of the century. Friends and luminaries have gathered to witness her findings but before anyone can say “Tutankhamun”, June is found dead, killed with a poison dart shot from a blowpipe. This was no curse, this was murder! Host your own party to find out who snuffed June’s candle! Ageing Beauty Queen (she’s only as old as the man she’s feeling!) Costume Suggestions : Your flowing, Greta Garbo-style locks compliment your stunning red evening dress, but the smell of cheap perfume and your fake jewellery somewhat spoil the picture. You spend most of your time with a champagne glass in one hand, calling everybody ‘darling’, and flashing your stockings at anyone who looks like a film director. I’m a model and I was once crowned Beauty Queen of the Nile. My classic grace and poise has earned me regular modelling work. My dream, however, has always been to act, so I was delighted to be given the lead part in a film about Queen Priti-Titi and the discovery of her tomb.